The way that UMass Lowell women’s basketball coach Tom Garrick sees it, coaching is a lot like parenting. The new coach does not look at winning so much as he does personal development of his players; Garrick remembers that his players are human and aims to build their confidence with his even-keeled approach to coaching. Garrick is the team’s eighth head coach in program history and arrives after the team’s first postseason appearance in its Division I era. His inaugural season at UMass Lowell has had its successes and challenges. In an interview with The Connector conducted in mid-October, Garrick stressed that the season results are not a giant focus of his. “The bottom line for coaches is, if you win you keep your job. If you lose you get a chance of not keeping your job. And that’s a tough position to be in if that’s the way you look at it every day. I don’t feel that way,” he said. He recognizes that he arrives at UMass Lowell at a very special transitionary period. He said that he was initially drawn to the school for the opportunity it offered him, and as a New England native he was happy to take a head coaching job close to home. “I left Boston College to come here. I think [UMass Lowell]’s in a great position, being in transition from Division II to Division I,” said Garrick. He previously served as the Eagles’ assistant coach in women’s basketball. Garrick says that he believes he can use his experience as both a coach and a player to help UMass Lowell succeed. His even-tempered nature may come in very handy for the River Hawks as the season goes by and tensions rise as it tumbles to postseason play. He is prepared to be patient for change. He says that prior to being hired, he paid no mind to the team’s previous record. Continually referring to this season as a “blank slate,” he seems to look forward to blazing new paths with a new team. Each player will earn their spot on the team with their play. Garrick coaches fairly; he says that he will give each player who gives effort the benefit of the doubt, and any player failing to do so may find themselves dealing with what he refers to as the “disciplinarian side” of himself. His best interest lies in his players and how they are feeling. If they feel fulfilled and valued as basketball players, then he believes that the rest will come. “You can build anything as long as people feel like you care about them and that you want them to excel,” said Garrick. 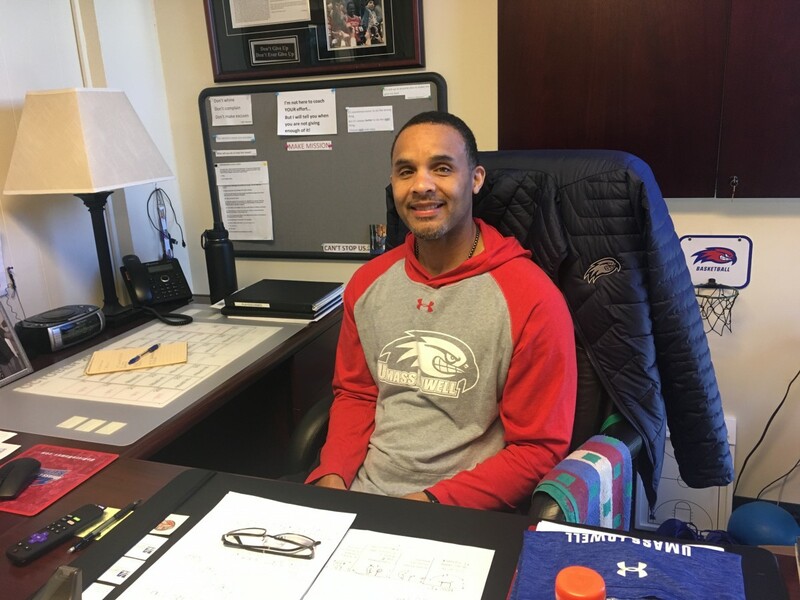 Garrick is a soulful man, and although he has only been head coach for a few short months, he feels attached to and validated by UMass Lowell. “I feel that God has put me here for a reason. This is where He wanted me, and I’m going to do the best I can,” he said. His interest in UMass Lowell came from the devotion that people like former Athletic Director Dana Skinner, current Athletic Director Peter Casey and Chancellor Jacquie Moloney felt towards it. Garrick says that his main goal this year is to establish a culture of self-esteem, which he hopes will convince people on the outside that UMass Lowell women’s basketball is a team worth watching.